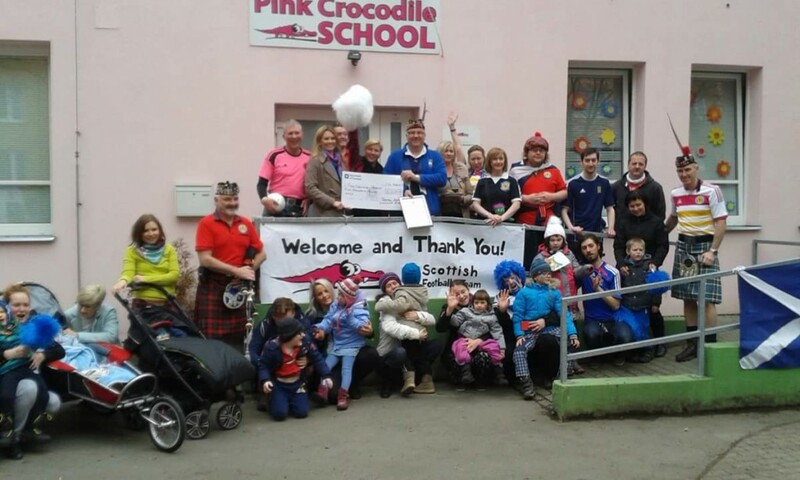 A return to Prague in the Czech Republic started off our donations for 2016, where we selected Pink Crocodile, a school in the heart of the city. Pink Crocodile is a small school catering for up to 20 children who are all deaf, and have other complex needs. The presentation turned into quite a challenge, as my flight via Brussels was cancelled on the morning of the Brussels airport bombings. However, (with many thanks to Linda Johnstone a Sunshine Appeal supporter and her colleagues at KLM in Edinburgh airport), I was transferred within 30 minutes to a flight via Amsterdam, which allowed the formalities to go ahead on Wednesday 23rd March. 17 children, family members and staff were present at the school, when 14 Scotland supporters arrived in the school bus sporting a massive Pink Crocodile. The Saltire flag was flying high at the School. We mingled with the families and chatted freely, understanding the purpose and objectives of the school. 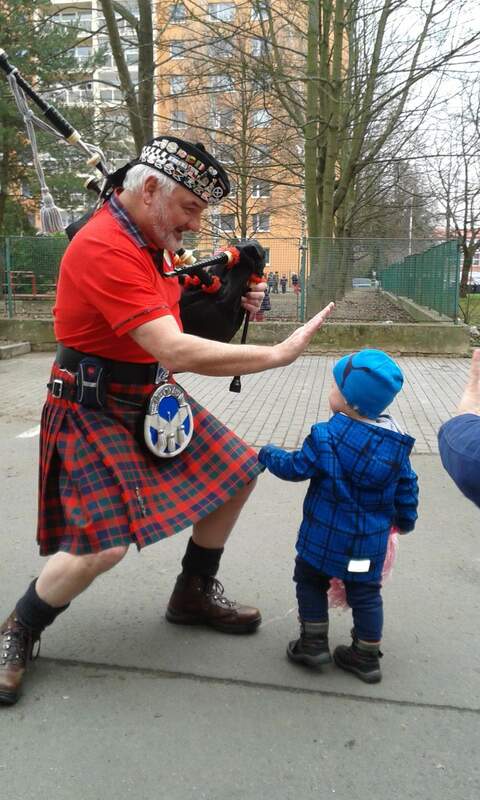 The Sunshine Appeal’s official Piper, Dougie Wotherspoon, played a few tunes on the bagpipes to the delight of the kids and families, as well as all the residents in the surrounding flats!!!! 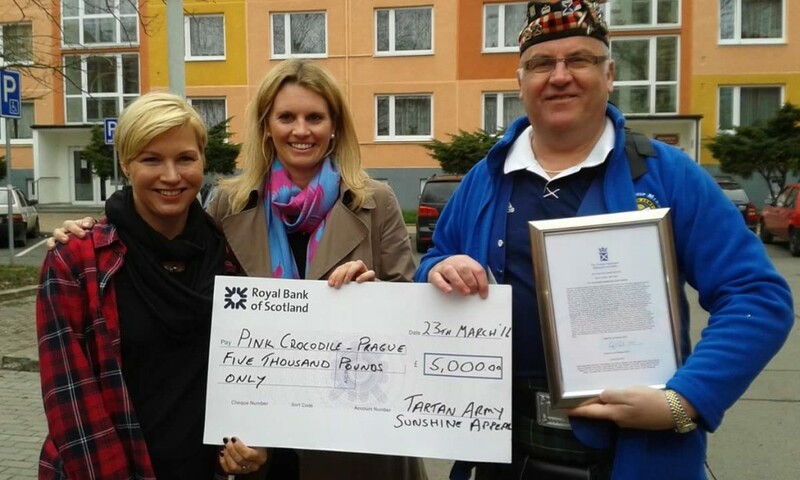 I presented our cheque for £5,000 along with a motion from the Scottish parliament to school staff. We spent 90 minutes at the school where they supplied us with “scotch eggs“ and donuts for sustenance. The kids showed us how they played football and sang a song they had rehearsed for our visit. Another hugely successful presentation and many more friendships were formed on behalf of all Scotland Football supporters.